Thought-provoking "Torture" Closes This Weekend! 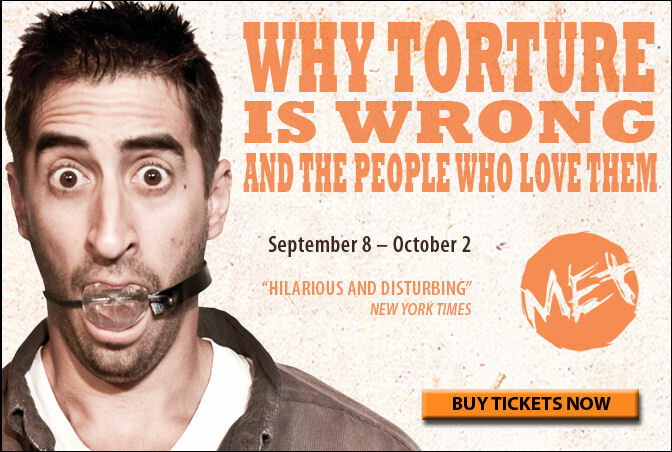 "Torture" closes this weekend! We have 4 performances left: Thursday through Saturday at 8pm and Sunday at 7pm! "The play turns out to be an emotional roller coaster ride that spits you out with some things worthy of reflection. And it does so very well. There are strong performances from a uniformly excellent cast... The strength of MET is in its ensemble. Even in a play like this with very clearly drawn, individual characters, Director Gené Fouché keeps the very disparate character elements together in a cohesive whole. This play is not for the meek of heart. It is for anyone who enjoys good theater and being challenged to 'think outside the box.'" "[Torture] uses humor to make you think, and at it's best, squirm... [The character of] Felicity believes 'you can choose to be your better self'; Durang clearly wants to believe this can also be true of governments. It's a notion that Maryland Ensemble Theatre puts across with humor and hope." "Director, Gené Fouché, manages the farcical chaos and hairpin turns of the script without resorting to sitcom cliché, treating the subject matter with a seriousness and intention that is considered and intelligent... It made all of us think. It made all of us question our own beliefs and behaviors and for that, the MET is to be congratulated. Theatre should provoke and inspire debate and, even sometimes, discomfort, which seems to be what Durang intended with the show, and what the MET has achieved." Hope to see you at the MET this weekend! Opening weekend of "Torture" has been wonderful. Audiences have been very responsive and we were fortunate to have some great press for this week. 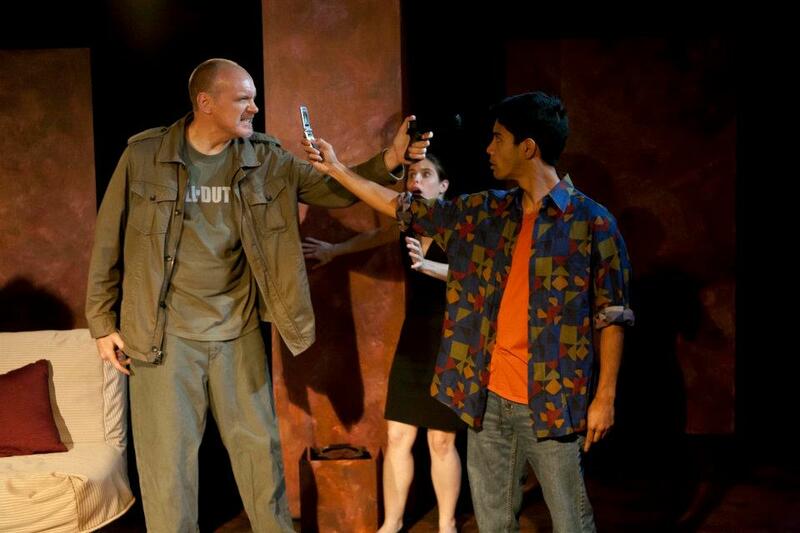 Mike Spain of Maryland Theatre Guide gives "Torture" 4 out of 5 stars! "A quite funny and outrageous show... a dark comedy which will make you think long after the performance... Director Gené Fouché directs a talented cast... The Maryland Ensemble Theatre is a wonderful place to see a show. The seating is intimate without a bad seat in the house." Torture Gazette Interview and Opening! "Torture may be wrong, but as seen through the eyes of The Maryland Ensemble Theatre (MET), starting Thursday — it’s also darkly funny. Just prior to the 10-year anniversary of the terrorist attacks of Sept. 11, 2001, the MET will tackle a production of “Why Torture is Wrong, and the People Who Love Them,” a comedy by Christopher Durang. The play’s heroine, Felicity, wakes up after a night of drinking to find Zamir, a strange man of an indeterminate ethnicity, in bed with her. Having no memory of how she met him, and due to his erratic behavior, she concludes that he must be a terrorist. Felicity goes to her parents for help, and things get worse when she learns that her father, Leonard, is a member of a shadow government who decides to take the situation into his own hands by torturing Zamir into a confession. As things spiral out of control, Felicity wishes more and more for a rewind button, but the outcome is more likely to leave the audience in stitches rather than cowering in fear, says director Gené Fouché." Hope to see you sometime during the run!